Energy Post Productions (EPP) is a growing, debt-free and profitable digital publishing company. EPP comprises two successful open platforms for debate and analysis – Energy Post (based in Europe) and The Energy Collective (based in the U.S.) – plus a premium newsletter with a growing subscription base. With our websites drawing over 100,000 unique visitors a month, two free weekly newsletters which go to some 13,000 registered subscribers every week and some 94,000 followers on social media, EPP is one of the world’s leading publishers in the energy sector. Our mission is to offer the best independent analysis, debates and insights on the global energy transition. Some people think that we already do! To achieve further growth, we are now looking for a publishing partner or other type of investor who sees an opportunity to help us carry our titles and mission forward. Energy Post is our European based website. Freely accessible, high traffic and highly influential. For full details of the readership, growing at 25% per year, and our commercial performance to date, please get in touch. We can share the analytics and the results of our September 2017 readership survey. 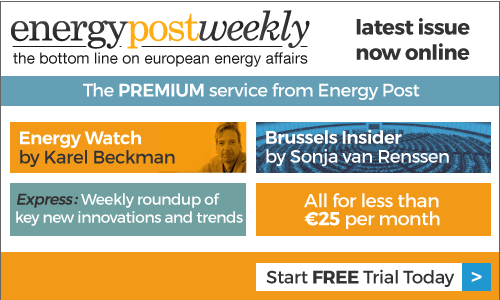 Energy Post Weekly is our premium weekly newsletter available via a secure website. Standard subscription rate is €295 per year. After only 15 months we now have a solid base of over 200 company and individual subscribers. The Energy Collective was acquired by EPP in January 2016. This 11 year old, moderated platform goes from strength to strength. For full details of readership and commercial performance, including our September 2017 reader survey, please get in touch. Our Brussels debates are attended by key stakeholders in Europe’s capital. Expertly moderated, we attract the strongest possible panellists to ensure the debate counts. Together with Shell, we publish the EUenergy App for iOS and Android mobile devices. Our business model is underpinned by a growing number of subscribers to our premium, weekly publication. Our main sponsor for the last few years has been Siemens AG. For an initial discussion, please write to commercial director Matthew James or editorial director Karel Beckman. And do feel free to spread the word!